Our Alder box beams are carefully crafted here in the USA, in our carpentry shop in Arizona. We have experimented with design and technique to create the ultimate custom Alder beam, crafted from real wood and indistinguishable from traditional beams. Lightweight and easy install make them the perfect decorative Alder ceiling beam for remodels! There are many ways to incorporate Alder box beams in great rooms, recreation rooms, living rooms, dens and more. The Spanish style that also dominates the Southwest with warmth and luster with vigas in all of the rooms and in the exterior structures, offer a welcoming feeling of the old Southwest. Once a home has been designed with the structural and aesthetic substance and beauty of wood beams, there is no other way to decorate a home. Making the most of the plans to use alder beams can be done with hewn and finish in mind to create that heartening look of a rustic home of the Southwest or a luxurious home with Tudor style beam and trims. For a long lasting and durable variation on the theme of vaulted ceilings, a style of ceiling beams that is popular to use are Alder beams. 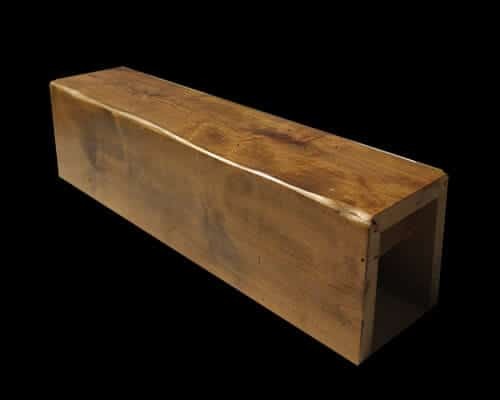 It is a simple matter to contact Woodland Custom Beam Company with inquiries about pricing and styles, particularly the Alder Box Style Beams Hewn, which can be ordered with electronic bids. All questions about the beam making process and ordering assistance is available online or by telephone. The beauty of high ceilings adorned with a decorative real beam, adds a sense of ambiance and decor that will also add value to the home. The beam that beautifies must also be made to a standard that will add character and depth without signs of defects or poor quality. Most beams that are purposed with decorative qualities must have characteristics to stand up to inspection of the eyes of admirers as well as those of craftsmen and carpenters that manufacture the beam to fulfill orders. The Alder box beam should suggest that perfect shape of a box all along the surfaces of the beam. The surfaces must be treated and stained to add color, texture and a finished look so that when they are installed in the ceiling, they will intensify the richness of the room and not distract from it with any signs of cracking, torsion or flaws. Alder Wood Beams with routed edges will enrich any room and make a homeowner proud. Woodland Custom Beam Company will accept electronic bids and provide pricing. Now adding the richness of alder beams to the home is easier and affordable for any home owner. The hollow structure of the alder style beams is a naturally improved wood decorative structure that will add value to the look and feel of the ambiance of any room. No matter what the purpose of the room, be it the kitchen, recreation room, family room, living room or other, the style of alder wooden beams with its hewn and texture will add beauty and character to any room. That home owner or new home buyer will delight in learning the ease that is involved in ordering the Alder Box style beam Hewn. Ideas will sprout wings when planning to build with the beam and spruce up the look and feel of any room. Getting an order fulfilled is simple when sizing up the need of material purchases. Using the alder beam look will make ordering a breeze as this style of beam is well stocked in the materials that may be the most alluring to the buyer. With the box beam that goes along with the alder wood shape and feel, a beam network in the ceiling of a young or new building project, does not have to be a barrier of taste.